Back in 2009, I learned how to make a five pointed star book. At the time I jotted down notes to come back and make a version of this book with the lyrics of "The Star" by Ann and Jane Taylor. 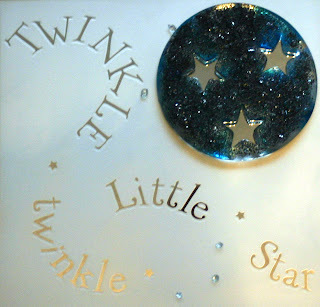 "The Star" was originally published in Rhymes for the Nursery in 1806. Although I have not abandoned the idea, I have yet to make this book. The inspiration however still managed to find its' way out. Hear are the five verses to "The Star". So many of us know the first stanza but how many of us today are familiar with much more. I certainly was not. Currently this piece is on display at Artisans of Rocky Hill. Framed and ready to be hung, this would be a lovely addition to a child's room. A contemporary connection to a very traditional pieces of Children's English Literature. The San Antonio Glass Art Guild (SAGAG) is excited to be one of the participants making our 4th annual appearance as Glass Alley, as part of San Antonio celebration of the arts Luminaria. We'll be there along with the San Antonio Society of Artisan Lampworkers (SALSA), Larry West and his mobile glassblowing unit and The Brothers of the Flame on the evening of Saturday, March 12, 2011. Check the Luminaria website for information on transportation, parking and the locations of participating artists. This fun and fascinating event is free to the public. Come and enjoy the festival atmosphere and stop by Glass Alley to say hello. See previous Luminaria posts from 2008 and 2010 to get an idea of what you can expect.